The Science Ed Resource Center at Carleton is one of the places I check in on, and I just saw the page linked above. They're looking for HS teachers who can teach the Climate Detectives module, which has 6 sessions clocking in at about 600 minutes of class time, and 1) have a colleague observe a session, 2) have students take a post-module test in 2 weeks. The aim is to improve the module for others. Look at the webpage for more details -- this is just my quick summary to give you an overview. TERC will also pay HS teachers who can participate a small honorarium to compensate some of your prep time, as well as a materials allowance. You'll need computer lab space and computer lab resources for your students (Flash, Excel, RealPlayer or other media player). You'll also need some support from your principal and students/their parents. And you'll need to do the whole thing before May 15, 2016. The Climate Detectives module does look cool: it talks about cores (those long strips of earth or ice drilled out by scientists) and Milankovich cycles (large-scale cycles from the wobble of the Earth, etc., which I mentioned once in a discussion of climate modeling) and geologic time and particle sizes for sand and mud. Very sciency, but with a lot of use of data. Advertise to friends and colleagues! Be a guinea pig for climate science teaching! Feel trapped by boring fake word problems in your math textbook? Get intros to real-life issues in the natural world and see math at work. Geek out about butterflies and aquifers while upgrading your analytical skills -- sign up for the (episodic) EarthCalc newsletter! I've been playing with a lot of temperature data lately: you can see a short Python analysis of temperatures over at my personal blog. At work (at the University of Minnesota) I'm working with some masters' students on research into the finance of weather derivatives and catastrophe bonds, so I've been thinking a lot about temperature, El Niño, snow in Siberia, etc...! I've also been thinking about how to teach probability and statistics. So, this post is about using the normal distribution and spreadsheets to deal with real data! November has been very warm, even though I picked the coldest days to go winter camping. How warm is our November here in Minneapolis-St. Paul? I saw this question on Reddit: "How are formulas created?" (Turns out Reddit has a lot of people asking math questions!) The answer provided by commenters is "mathematical modeling" -- done in science courses! This answer makes me sad! Mathematicians make plenty of models, too! When you think about it, though, how many high schoolers get to see that? In fact, how many sophomores in college have ever seen math at work making models? Well, here are a few examples if you're interested! Lynx! for cute fuzzy animals with sharp teeth! These two posts have students develop their own trig model for lynx populations, see how bad that model is, and then use a logarithm composed with the trig function to get a model that better fits the sharp population peaks. Sometimes I feel like teachers who make room for this material are swimming upstream since so many of our high school math curricula don't provide the time for experimental, living mathematics... but every now and then I meet someone who really makes it work. And maybe with modeling as one of the high school Common Core standards there will be some official space for this in high school classes! It is so sad that students can go through 12 years of school and never really see mathematical model-making at work. Well, the semester is coming to a close again. Two more weeks of class and then finals. My corn has grown pretty tall and survived a squirrel attack, and next weekend I should be able to plant it outside: April 30 is our average last frost date in my area. It's been a nice week weather-wise, though, and so the plants are outside in my thrown-together "cold frame." 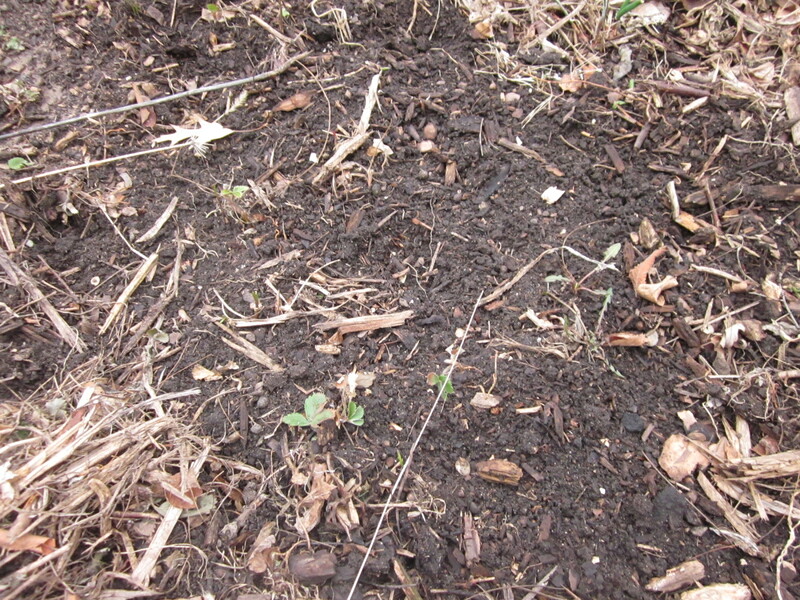 I'm using soil with built-in compost for the young plants since corn is a heavy feeder, and once I move them to the ground I'll put them into areas where I've pulled up the hairy vetch (which is supposed to fix nitrogen) and added more compost. We will consider manure, but for the moment it seems like we might make it with the contents of our own compost pile this summer. The benefit of working without commercial fertilizer is that we don't have to think very hard about whether we're contributing to the nitrates in the Mississippi river -- even considering that urban areas contribute less than 10% of Minnesota's nitrate runoff. The Star Tribune (the Minneapolis paper) had an article this weekend about nitrates in well water in the rest of Minnesota. It's costing taxpayers a lot of money -- up to $3,300 per household in some areas to install nitrate-removal equipment and ensure that people can drink the water safely! In fact, nitrates made the news because in Randall, MN, people can't drink the water safely. Nitrate levels are too high and dangerous to human health, especially babies and the elderly. The majority of nitrates in Minnesota water come from agricultural fertilizer runoff, and dealing with the runoff has become a hot local political topic. It's not just a problem in the Gulf of Mexico when it's affecting our local drinking water and lakes. It is a pretty basic worksheet -- provides enough information for a social-studies debate starting point, but not much more. It would be very cool to make some more sophisticated optimization problems for nitrate use, to help students (and perhaps the public) think about the tradeoffs involved in agriculture and environment. 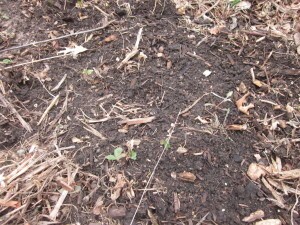 It's spring in Minnesota, which found me flinging hairy vetch seeds from a flowerpot into the back yard. Let's back up a moment. My garden fever has been ramping up; those of you who live in the great frozen north might understand the hunger to see green things. It's why all the undergrads were in shorts last week (that and we set a record of 84 degrees!). For the past few years my husband & I have tried to start seeds in egg containers, and every year something terrible happens: they blow off the porch, or they all drown in a big rainstorm, or squirrels eat them. No more. This year I marched into Eggplant Urban Farm Supply a few blocks away and made a stand. I spent what felt like an exorbitant amount of money, but it'll be less than a dollar a plant even if we have a few failures. I got a seed-starting tray and a seed heater for our cold house and some hairy vetch and inoculant for nitrogen fixation! 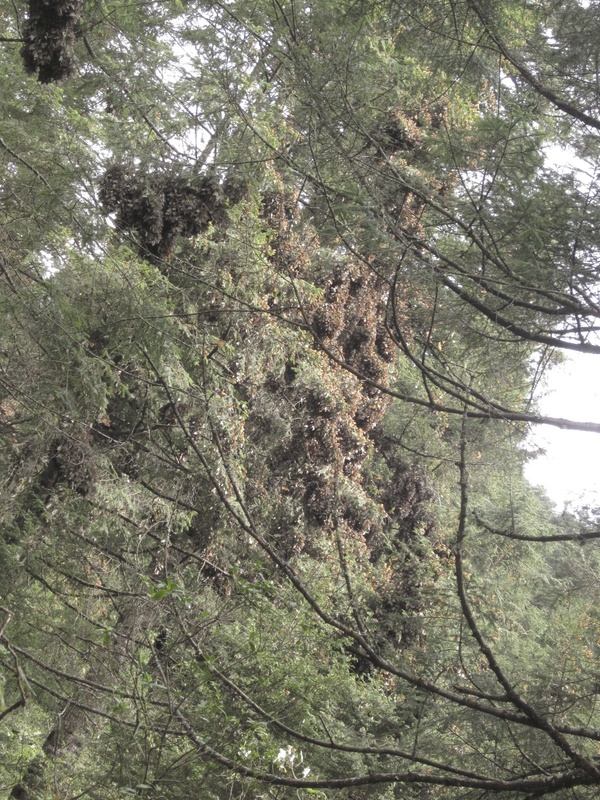 South and north: Monarchs overwintering Mexico have hit pause on their reproductive lives. Really, it's called reproductive diapause! They get to live 6-9 months down in the highlands of central Mexico, living on the oyamel fir trees in the mountains. 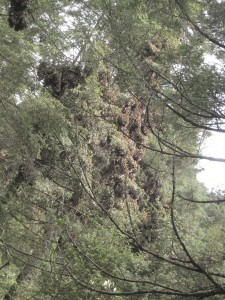 This is not a beach vacation: the monarchs cover the trees high up in the forest. 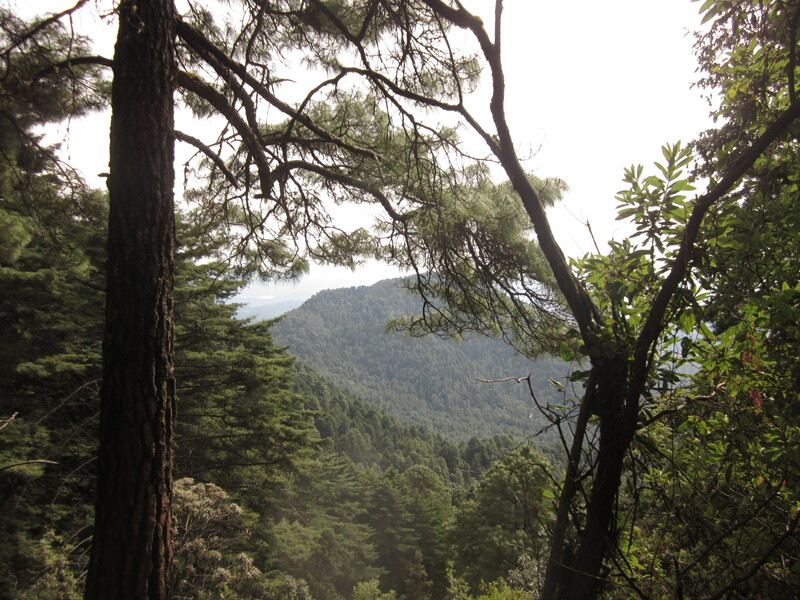 I had the good fortune to visit Cerro Pelon butterfly reserve last January with Joel Moreno of Joel's Butterfly B&B, and these are pictures I took from that trip. Last week I left you with the question of matrix models for populations versus differential equations. Matrix models are discrete -- they jump from time 1 to time 2 to time 3 -- and differential equations give a continuous description relating rates of change to the quantities in the system. Bees and butterflies are both pollinators, both pretty, both summer insects (up here in the north) -- why would we use different models for the two? First off, if you're familiar with solving systems of differential equations, you might remember that matrix methods are pretty useful in that endeavor! Matrices allow you to solve systems of linear differential equations. Euler's method basically reduces differential equations to difference equations/matrix methods. Differential equations can be really hard (or currently impossible) to solve. Matrix models are computationally advantageous and let us deal with small populations really concretely. If we can chunk up the life stages of a population, as with the turkeys in last week's post, we can do some pretty slick matrix modeling. I think it's the structure of the lifecycles and lifestyles of bees vs butterflies that drives the choice. Let's think about this: bees live in hives, the same one for a long time. We can think of a hive as a population whose health we want to model. There are different classes of bees in the beehive, but they all live in the hive at the same time. Butterflies live as individuals rather than in hives or herds, so we can't look at any population smaller than a regional one. Moreover, the migration of monarch butterflies is a really big deal. The winter monarchs -- the ones who fly to Mexico -- have very different lives than summer monarchs. They live a lot longer and in different places. It's almost as if there are two kinds of butterflies separated in time. The time and space dimensions for modeling these populations, then, are pretty different. So, that's one set of reasons for using different modeling techniques for these different populations. Can you think of others? Fibonacci numbers for rabbits and cows and bees! A math circle problem set with a picture of Fibonacci's original writing. Stepping up in "grade level" and sophistication, a whole book on difference equations and differential equations. I think it would be appropriate for knowledgeable undergrads. A bit of a tangent, but a very cool paper about decision-making among beehives. Lots of math, but also good writing and thought-provoking philosophical implications. Looks like I'm getting drawn toward longer projects here, like the bees and the butterflies... we'll see what happens! Raccoon River: A while ago I wrote some posts about the Raccoon River in Iowa, and the flow of nitrates into the river. The posts talked about how fertilizing our big corn and soybean fields can lead to problems with nitrate runoff, especially in spring when the snow melts and washes leftover fertilizer into rivers and lakes. The associated worksheets were about increasing/decreasing functions, average rate of change, interpretation of graphs, etc. It's spring again! Nitrates are a topic with continuing relevance even though the worksheet data is from 2013. Recently, the city of Des Moines voted to sue three Iowa counties for not managing nitrate and nitrite runoff: according to the linked National Public Radio report, removing the nitrates in 2013 cost the city $900,000! The New York Times (coincidentally?) recently featured an article about no-till farming, which reduces fertilizer runoff. So, how much agriculture is practiced in your state? How big an impact does fertilizer runoff have on your ecosystem? Consider asking your students to report on whether their families fertilize their lawns, and find out what your community is doing to deal with runoff into lakes and streams! However, differential equations can be really hard to solve. Sometimes it's nicer to take a discrete rather than continuous approach: use a matrix model! In a matrix model, you divide time up into discrete steps: months or years or stages of life. Then you multiply a population vector that gives population at step n by a matrix that tells you how each population changes. That gives you a new vector that gives population at step n+1. The number of poults each year depends on the reproduction of yearlings and adults. So P(n+1) = F2*Y(n)+F3*A(n): number of poults at time n+1 is a reproductive constant times number of yearlings at time n and a constant times number of adults at time n.
The number of yearlings at time n+1 is given by how many poults survive! Y(n+1) = Q1*P(n). Q1 is less than one. The number of adults at time n+1 is given by how many yearlings survive plus how many adults at time n survive. So that's A(n+1) = Q2*Y(n) + Q3*A(n). Here Q2 and Q3 are also less than 1 (no magical birth of old birds). It seems like the literature on bees all uses DEs, while the literature on monarch butterfly populations uses mainly matrix models. This might be because of monarchs' special lifecycle: most monarch live, mate, and die up north, in Canada, the eastern US, or the midwest of the US, but some make the long trip to central Mexico to overwinter there. (There's a smaller population that has the same pattern, but with the Rocky Mountains and California replacing the North and Mexico.) The overwintering monarchs live a much longer lifespan and really have a totally different life than the summer monarchs. I'm working on a worksheet for monarch modeling with a matrix. In the meantime, you can find educational links at Education World and Monarch Watch. Spring is the time to start thinking about butterfly activities, as the monarch migration north starts in April! The book is just about ready. I've been updating it at Leanpub, and it's your last chance to grab it before it goes on sale at Amazon and elsewhere! Last, I've gotta expand beyond calculus. There may be some probability or linear algebra mixed in here! My spring goal is to post regularly (max once a week, though), and to this end I'll start with some links on bees again. More research keeps coming out about possible causes in the decline of the bee populations world-wide, and there are many indications that a lot of factors have come together to contribute to the bee trouble. Since it's spring, you might consider planting bee and butterfly-friendly plants when you have a chance! It's not too hard to upgrade the insect-friendliness of your yard. In Minnesota, check out the U of MN resources on bee-friendliness. Other places will have different suggested plants. And look out for future Monday posts on EarthCalculus, starting with bees and butterflies!